Manufacturer of a wide range of products which include concrete admixture. 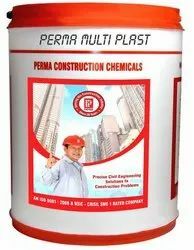 Perma Multi Plast is a unique admixture based on complex polymeric Concrete Admixture which works wonderfully with all grades of concrete in all weather conditions. It imparts high compressive, tensile and flexural strength to the concrete. This admixture is of immense use in making the concrete highly workable and in retaining the workability over long hours.